Whenever you apply for a job, your written application and cover letter will be the first point of contact with a prospective employer. That means that your cover letter should be a polished and professional as possible, so as to make a positive impression. Imagine the letter being read in Human Resources, passed along to the hiring manager and shared with the team you'd like to join. If the letter doesn't put you in the best possible light, it's not doing its job. Every employer will ask you to send along your resume; the cover letter literally "covers" the resume. It's also a tool for expressing your personality, enthusiasm, and knowledge to your prospective employer. Even if your resume is short, your cover letter can make up for that and earn you an interview. 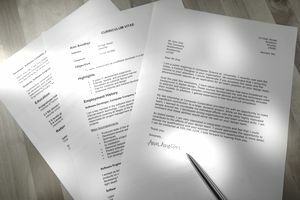 Cover letters can also provide an employer with information about your basic skills and preparation for the workplace. How literate are you? Do you know how to format and proofread? More importantly, do you take the time to be sure your letter is perfect before sending it off? Before writing a cover letter, it's helpful to do some research into the company to which you're applying. Why do you want this job at this company (as opposed to any job at any company)? Even if you're secretly willing to accept any decent job at any decent company, it's important to show each prospective employer that you've taken the time to learn about their specific organization. Balance the letter on the page by adjusting the spacing. Even if you are applying electronically, the employer may print this out to read, so it should look nice. Choose an appropriate font. Comic book sans is not an option. Best choices include Times New Roman, Arial, or Georgia. Write in a formal style (unless there is a specific reason for doing otherwise). This is an example of a cover letter for an entry level position. Download the entry level cover letter template (compatible with Google Docs and Word Online) or see below for more examples. I read with interest your advertisement for engineering positions at Acme Electronics. Your company is one of the leaders in the electronics industry, and I am interested in being employed by a company with your background. I was excited to see, in last week's news, that Acme Electronics was named one of the top cybersecurity companies in America. Enclosed is a copy of my resume that details my academic qualifications and practical experience gained through the cooperative education program. As you can see from my resume, I have a firm foundation in electrical engineering. My internship with CBI International also provided me with opportunities to learn first hand about the importance of cybersecurity, and gave me a good grounding in the nuts and bolts of the field. Thank you for taking your time to review my resume. I would welcome the opportunity to discuss how my education, practical skills, and background would qualify me to be a member of the Acme Electronics. My references are available upon request. Please contact me at 555-555-5555 or john.jones@email.com to set up a time for an interview. I look forward to hearing from you. Use “Enclosure” at the end if you are submitting your cover letter and resume via hard copy. If you are submitting via email, change this word to “Attachment” instead.